After several days of rain, the Sun came back! It is slightly veed but no matter: I was too eager to test the solar panels received three days earlier! I compared them to the panels bought in 2017 and 2018. Although this test has no scientific value, the observations have seemed interesting enough to be published. Not having a solar energy measuring device, it was not possible for me to measure the actual performance of each Panel. So I chose to measure the instantaneous power of the panels with wattmeters, in the sunshine conditions of the moment. And I compared 2 to 2 the panels connected each to an identical charge regulator charging the same battery. measurements made by veted Sun (repeat the test in other conditions of sunshine). However, these elements can not fundamentally call into question the results obtained. The C Panel being the most powerful, I took it as a reference. I calculated the ratio of the power produced by Panel A or B to the power produced by Panel C. The table above shows the relative efficiency of panels A and B in reference to Panel C, which therefore has an efficiency of 100%. Pushing the reflection further, I imagined an increase in the surface of panels A or B to get the same power as the C Panel. I then calculated the cost in corresponding A or B panels, and the corresponding panel surface. NB: I took into account the difference in the number of cells (Panel A: 16 cells, panels B and C: 30 cells). the power of panel C is almost double that of panels A and B.
at equal power, panel B is 21% cheaper than panel C.
at equal power, panels A and B occupy 90% more surface area than panel C.
in 2017, I totally discovered the universe of the solar panel, it had reassured me to buy at a large recognized website, the many exchanges by phone and email had given me confidence. 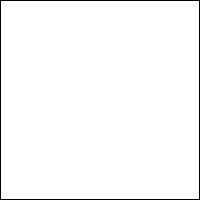 in 2018, I wanted to experiment with a low-spread panel format (6×5 = 30 cells) and I had found on the market only these panels at low prices. in 2019, I had the urge and the opportunity to invest in quality equipment, to increase the performance of my bike. A high price is not always a guarantee of the performance of the equipment. 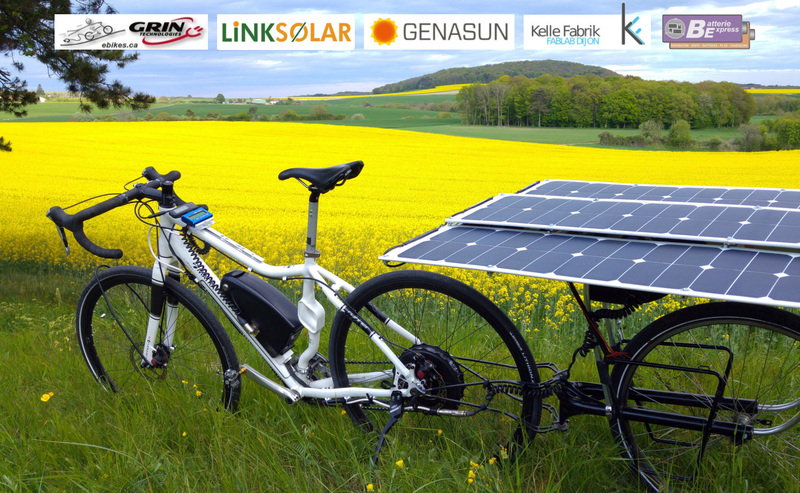 Lower yield panels (50%) have a strong impact on the solar bike: less autonomy or increased dimensions. In both cases, this will degrade the rider’s comfort and safety. A higher expense for quality equipment ultimately represents an economy: the value for money is much better. Justin works in an innovative Canadian company specializing in electric bikes. It creates equipments: batteries, motors, controllers, control consoles etc… Many SunTripers are equipped! 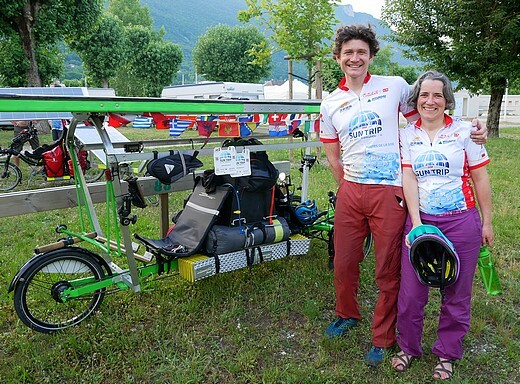 He participated in the Sun trip 2018, with his wife Anne-Sophie, on a solar tandem that he fully invented, where one pedal while the other oar! 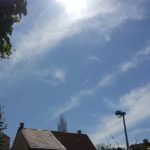 This article tries to shed some light on the reader on an important element for the choice of its solar panels: their performance. This is the ratio between the amount of electrical energy obtained by converting the light energy and the amount of solar energy received by a cell. What is the yield of the cells available on the market? When I first searched for panels, I read that the yield of this monocrystalline silicon cell was 15%, another 20% and some 22% (in 2017). Today in 2019, the best reaches 25%. Unfortunately, this feature is often absent from the panel specifications. 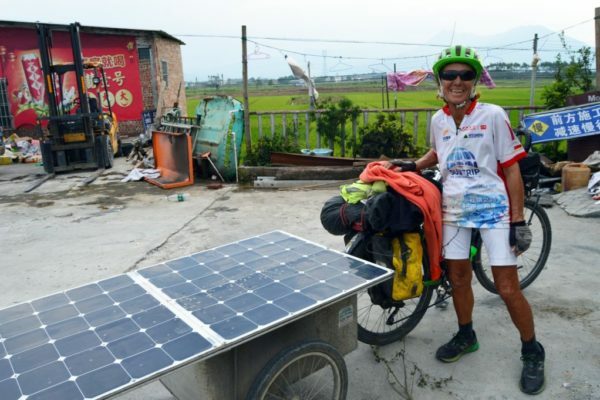 What’s the difference for the solar cyclist? With an equal Panel surface, a solar cyclist with high-efficiency cells (25%) will have 66% more energy than a cyclist with low-yielding cells (15%). The first one will be able to drive faster or longer, farther… or make less effort, according to his choice! 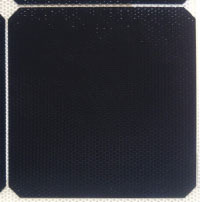 With monocrystalline silicon cells, in 2019, the yield reached 25% with the “back contact” technology, in the best panels. 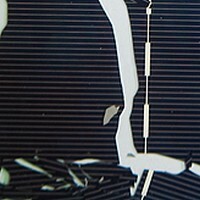 With polycrystalline silicon, researchers have succeeded in aachieving a record yield of 22,3%, but this technology is not marketed today (learn more…). In 2016, German researchers achieved a record performance of 33.3% with a cell called “multi-junction” (learn more…). 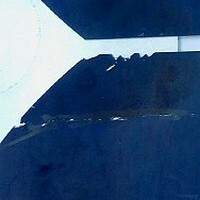 But beware, you will not find it on the Internet, this technology is dedicated to space applications! And in the United States, in Colorado, yields of 40.8% are displayed! It makes you dream…. but when will these technologies be available to the general public? 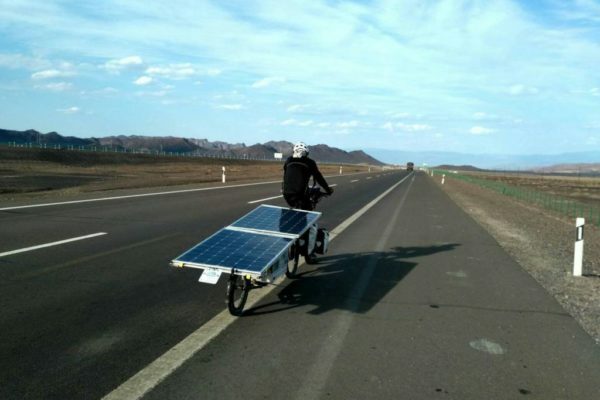 The solar cyclist is therefore tempted to acquire the cells with “high efficiency”. And why not the best of the moment? Then the question of the budget arises! As you will have guessed, the higher the performance, the higher the cost. Unless you have a very generous budget or partners, the solar bike Designer will have to make choices, and most often, compromises! Each one must first identify its needs, define its priorities in order to determine the optimal solution for its project. He will be able to equip himself with full knowledge of the cause. 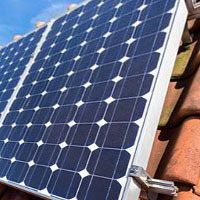 How to choose your solar panels? 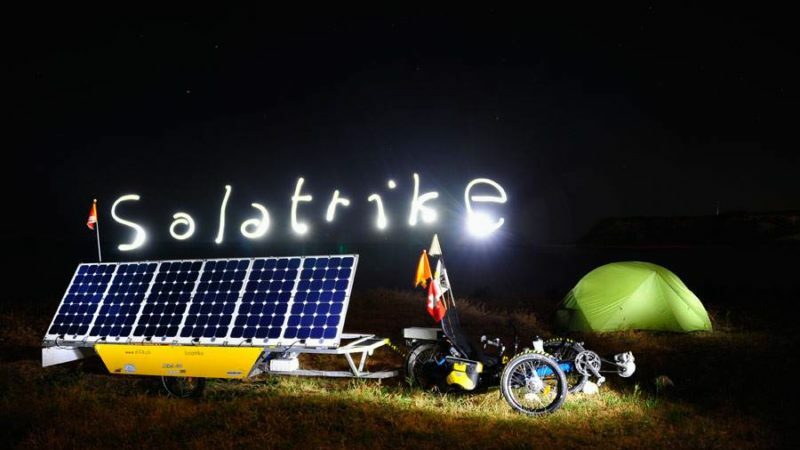 Photovoltaic panels are the key element of the solar bike: they convert the energy of the sun into electric energy that can be used directly by the engine and/or for charging the battery. When we start the adventure of building his solar bike, we are a little lost in front of the diversity of offers. I will therefore share here several elements that can guide you and allow you to make a choice with full knowledge of the cause. Flexible panels or rigid panels? 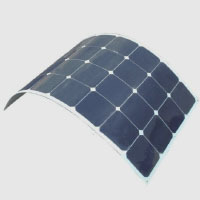 Flexible panels: this is the type of panel most frequently used for solar bikes. The reasons are their lightness (from 3 to 5 kg for 200W) and the good energy efficiency of the monocrystalline silicon cells that compose them (ratio between recovered electrical energy/solar energy received). More often than not, a supporting structure of the panels is added that rigidifies and protects them. In fact, every shock on a cell decreases its performance locally. With multiplied shocks, the total power of the panel decreases significantly and permanently. That is the weak point of flexibility. Rigid panels: they are sturdy, weatherproof like hail; they are planned a priori for a building installation. They are very heavy (15 to 18 kg for 200Wc). Their photovoltaic cells are often made of polycrystalline silicon with less energy efficiency than monocrystalline silicon. For these reasons, they are rarely used on solar bikes. 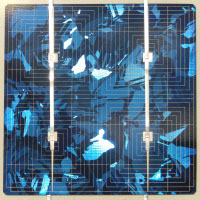 One exception, however: Christophe Dugué, who works at a French manufacturer, has built himself a rigid panel and light, monocrystalline. He experimented with it during the 2017 Sun Trip Tour. 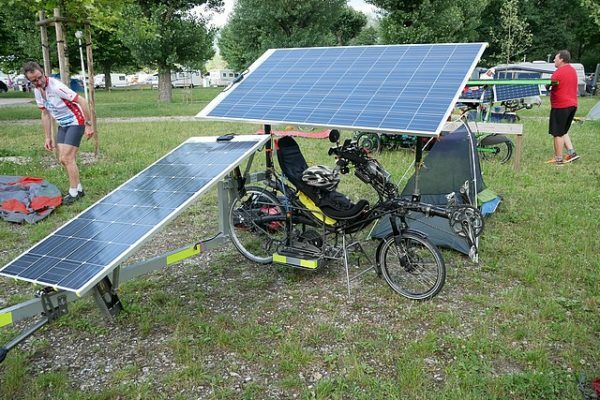 Stéphane Bertrand was also able to benefit this prototype during the 12,000 km of Sun Trip 2018. 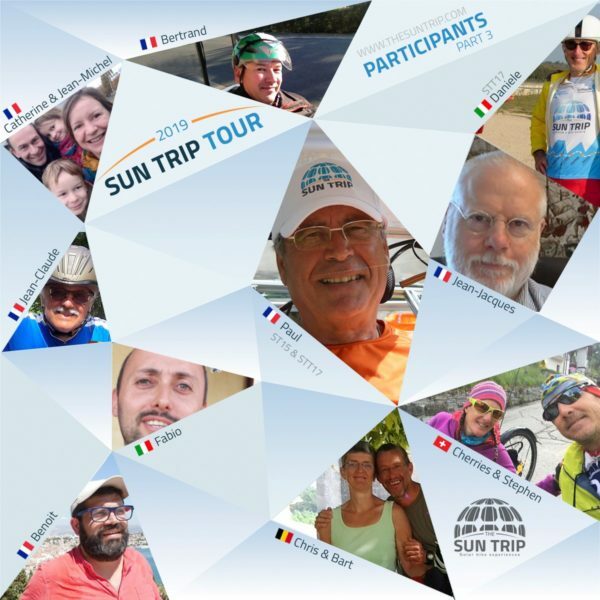 This summer, no doubt we will see these extraordinary panels again since Christophe Dugué and his wife participate in the Sun Trip Tour 2019. Unfortunately, these panels are not yet marketed. The power of a panel is proportional to the number of photovoltaic cells that compose it. The photovoltaic cell is the basic unit of a panel, it produces an electrical power of the order of 3 Watts under a voltage of less than 1 volt. The electrical characteristics are mentioned by the manufacturers. 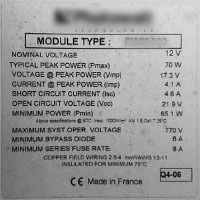 The main features are the operating voltage (VMP in volts) and the maximum current in the event of maximum sunlight (IMP in AMPS). Depending on the Assembly of the cells, in series and/or parallel, panels of the same power may have different operating voltages and maximum currents. choice of type and number of regulators (MPPT boost or not). Two main types of cells can compose the panels. 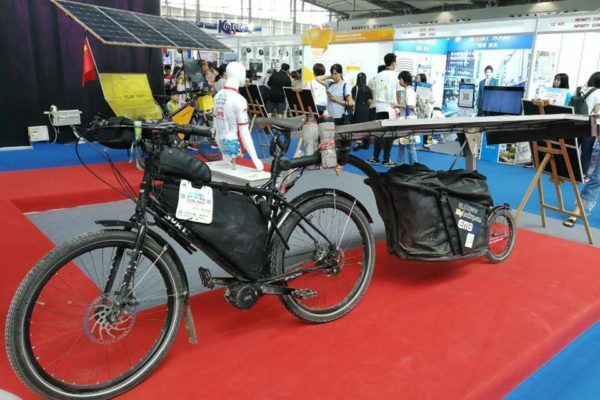 For a solar bike, because of the higher efficiency, it is the monocrystalline silicon that is most appropriate. -higher cost than polycrystalline silicon. -lifespan of ~ 30 years. -cost more economical than monocrystalline silicon. But it all depends on the user’s needs: Barnabas Chaillot, met during the prologue of Sun trip 2018, made the most economical choice [read more…]. “class A” cells: they are of very good quality, without visible defect and their electrical characteristics correspond exactly to the specifications defined by the manufacturer. The solar panels built with this cell class are therefore the most expensive. “class B” cells: they are of good quality and have little visible defects. Their yield is close to or slightly lower than the “class A” cells. “class C” cells: they show visible defects that affect their performance (e.g. chipped, cracked cells…). Their performance is obviously less good, these cells are used to realize the economic signs. “class D” cells: they present breaks or are incomplete. They can be resized to produce in smaller sizes, but most often their material is recycled to make new ones. More… All about the performance of photovoltaic cells! 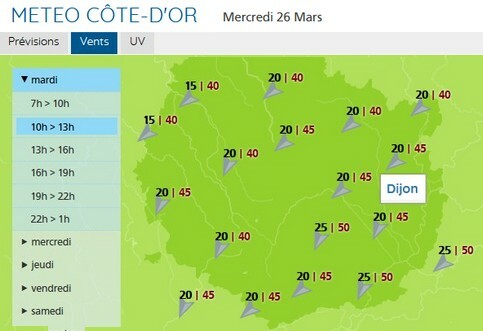 Today, the wind conditions were more favourable than last Tuesday, however the Vered Sun of the early afternoon provided less energy. By adjusting the engine power to 100W, I drove at an average speed of 31.5 km/h on a 90 km course with 650 m of positive elevation. Yesterday I experimented with my new solar bike! It is made up of a classic bike and a motorised trailer. I built this new trailer in order to support 3 solar panels of 100Wc (I only had 2 last year). My intention is to increase the length of my courses. 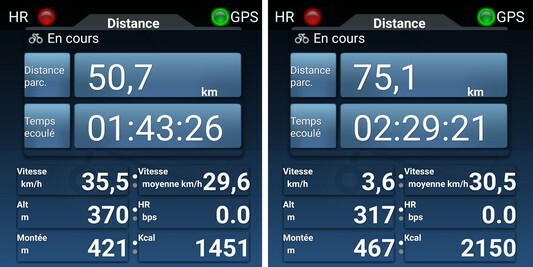 With 2 panels last year, I had completed courses of a little more than 200 km. With 3 panels, I now hope to exceed 250km per day. For this first 2-step test, I travelled a total of 129 km with 1080 m of elevation gain in 4h25. My average speed was close to 30 km/h. Due to the sunshine conditions, I set the electrical assistance between 90W and 115W with short moments at 225W. 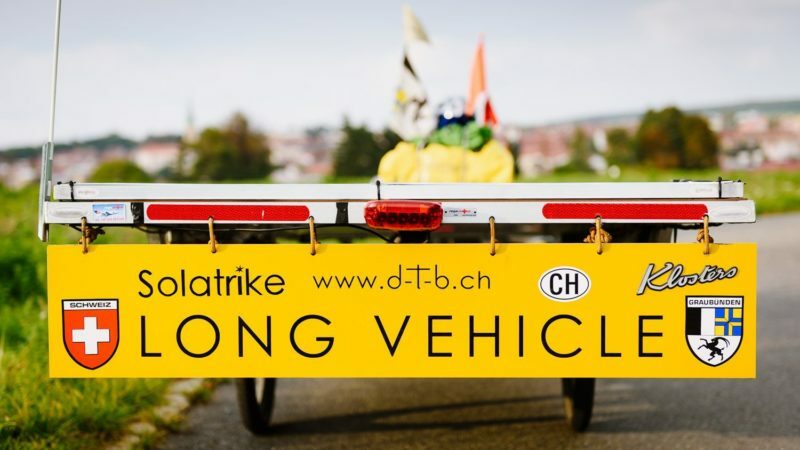 In quite unfavourable wind conditions (wind of 20/25 km/h with brutal gusts at 50 km/h), I was able to appreciate the good behaviour of the trailer, very stable in turns of the road. 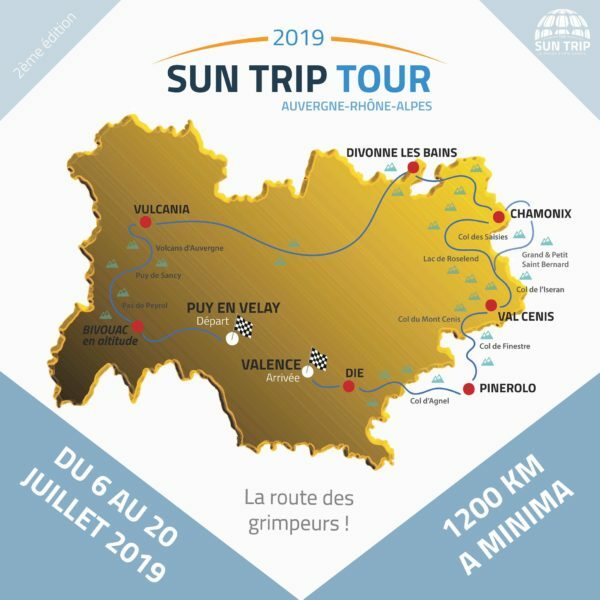 Discover the route of Sun trip tour 2019: a solar bike route that crosses the Auvergne-Rhône-Alpes region, from Puy-en-Velay to Valence, via the Monts d’Auvergne, Vulcania, Divonne-les-Bains, Chamonix, Val Cenis, Pinerolo (Italy) and Crest. 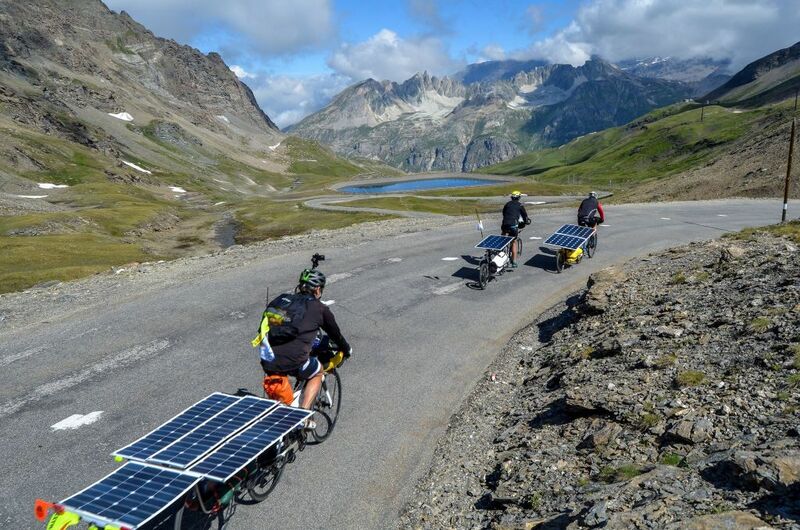 50 adventurers propelled by solar energy to attack the most beautiful passes of France! 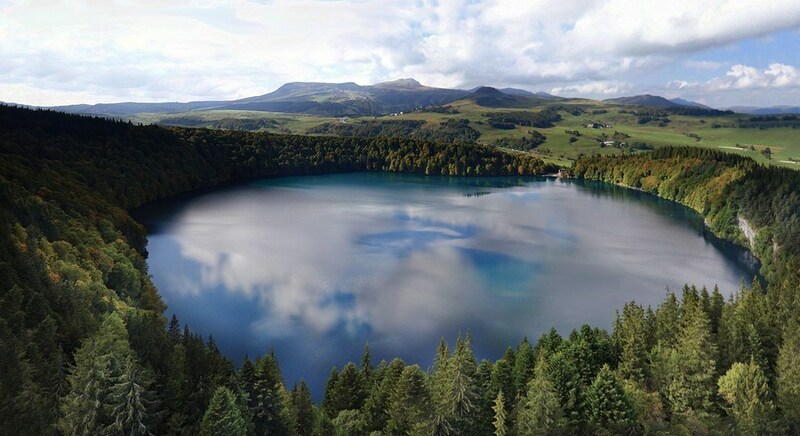 a project in partnership with EDF, EDF renewables, the region Auvergne-Rhône-Alpes and GEO.fr! 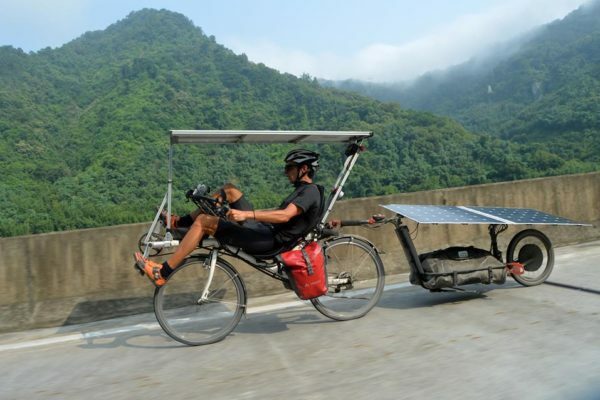 Everything you ever wanted to know about solar bikes! News on Sun Trip 2020! 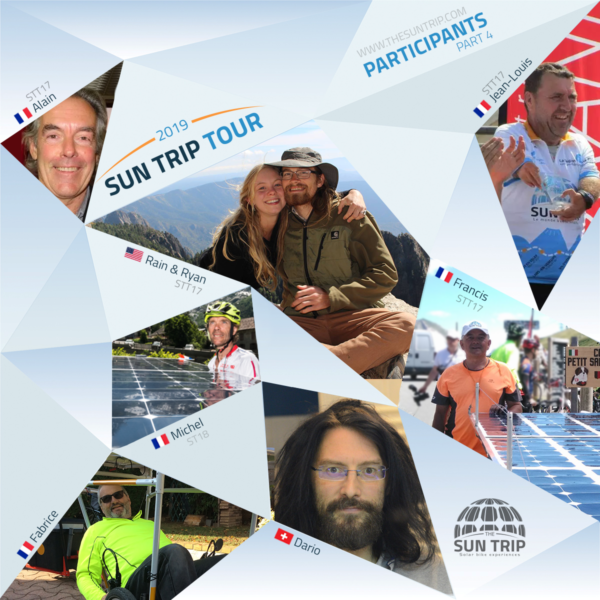 Sun Trip 2018: the video of the world’s largest solar bike rally! 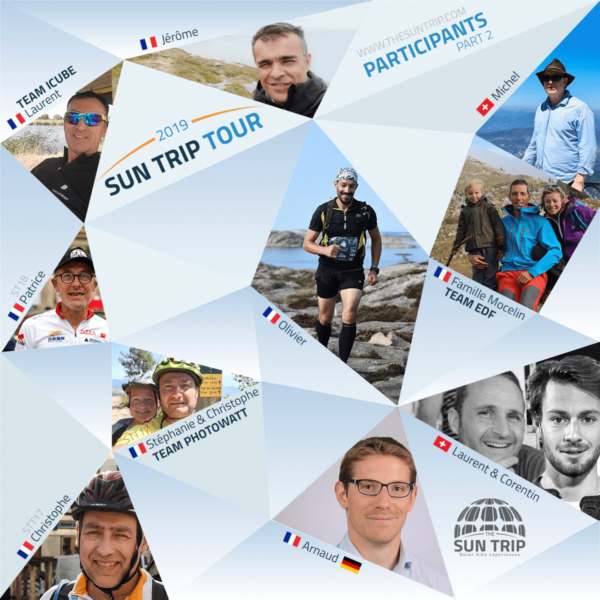 Discover the Sun Trip 2018 adventure of on this 1 hour video, filmed by the participants and carried out by the organizing team! What status for bike in France / in the Netherlands? Find the adventure of the Sun Trip 2018 seen by Zeppelin agency. 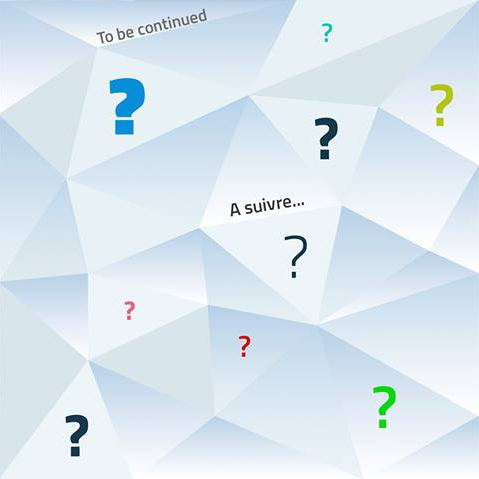 Report published by GEO Aventure. 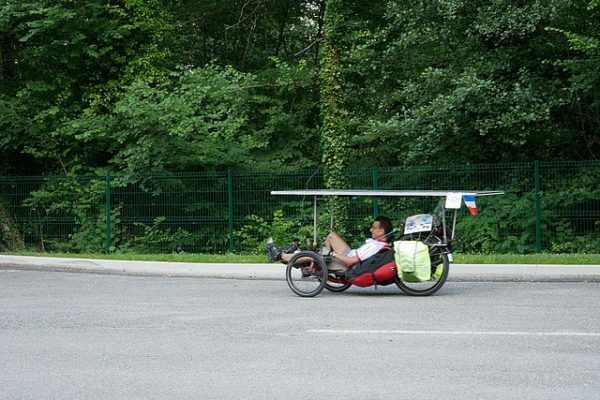 Barnabé Chaillot’s low cost solar bike ! 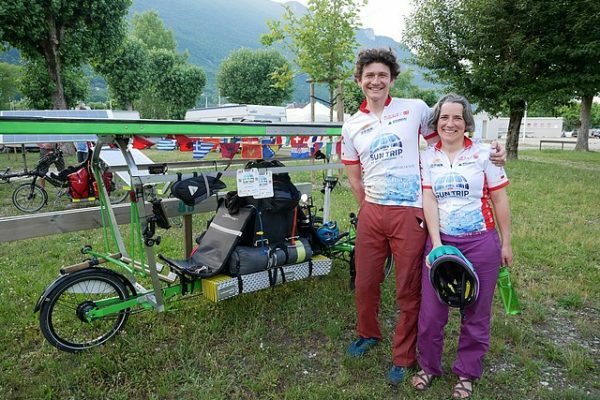 During the prologue of the Sun Trip 2018, I met Barnabé Chaillot at Le Bourget-du-Lac Campground: He also accompanied the solar bike caravan to Chambéry. 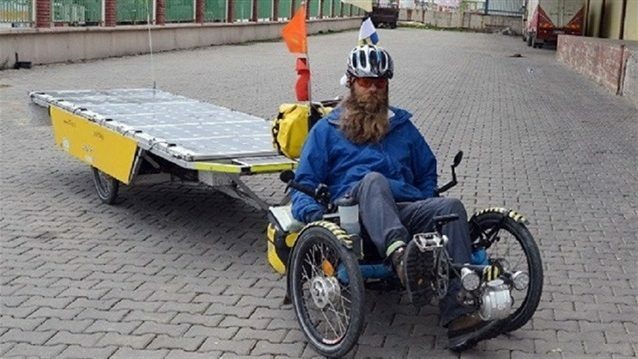 His solar bike was very unusual but I did not know his approach at that time, I discovered it according to my surf on Internet. 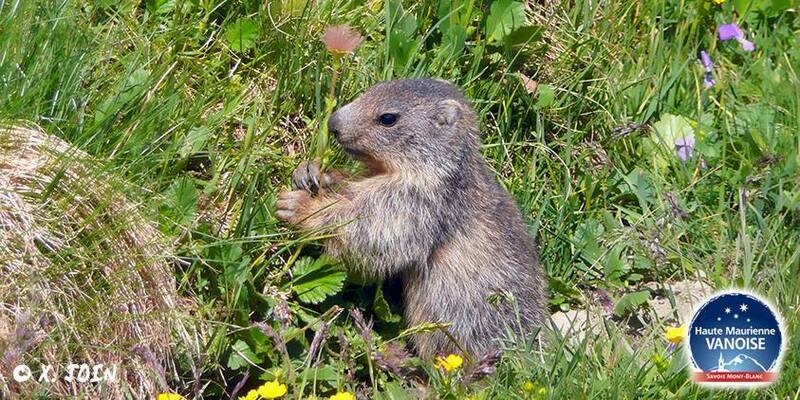 Barnabé wants to share his ecological ideas to protect our planet, ideas that he has put into practice for years. He chose to propagate them on the internet, among other things in the form of a YouTube channel. This video shows, step by step, how to build a very cheap solar bike, or rather a solar trailer to associate with a bike. 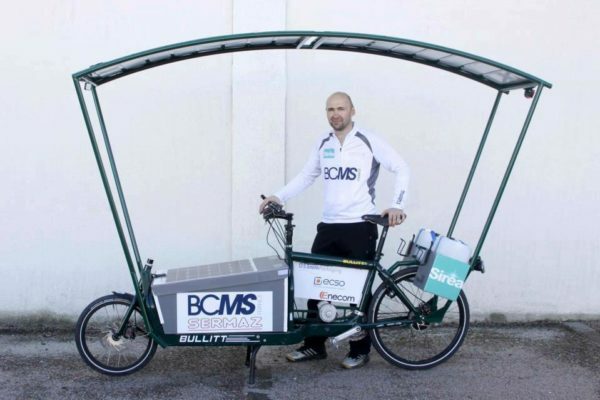 Whether you are planning or not building your solar bike, I invite you to look at Barnabé, to admire his ingenuity and his pedagogy, to delight you with this smile that never leaves him. The number of subscribers in his YouTube channel attests to the interest of Internet users in his alternative practices. 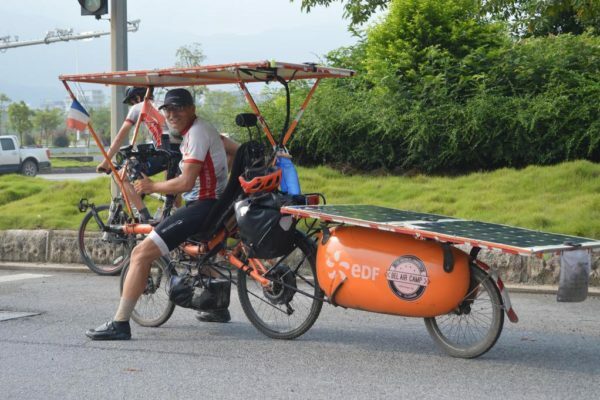 David Brandenberger’s world tour with solar bike! 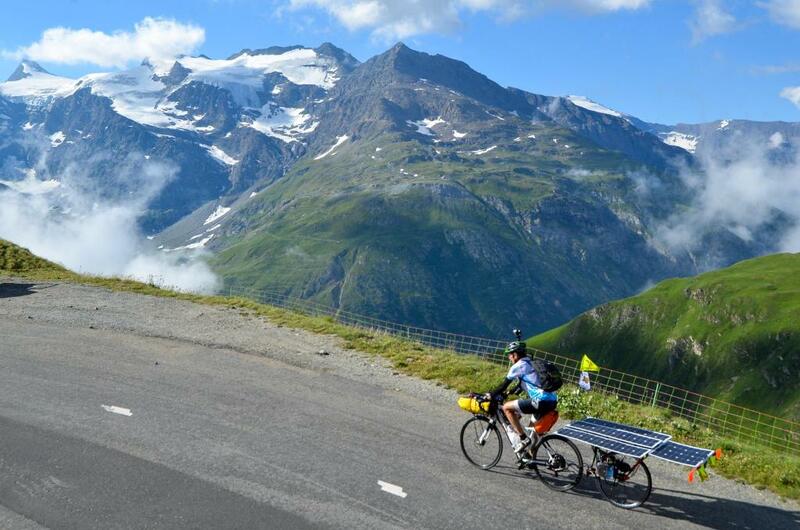 In July 2014, David Brandenberger (Switzerland) toured the world on a solar bike to prevent harm to the environment. 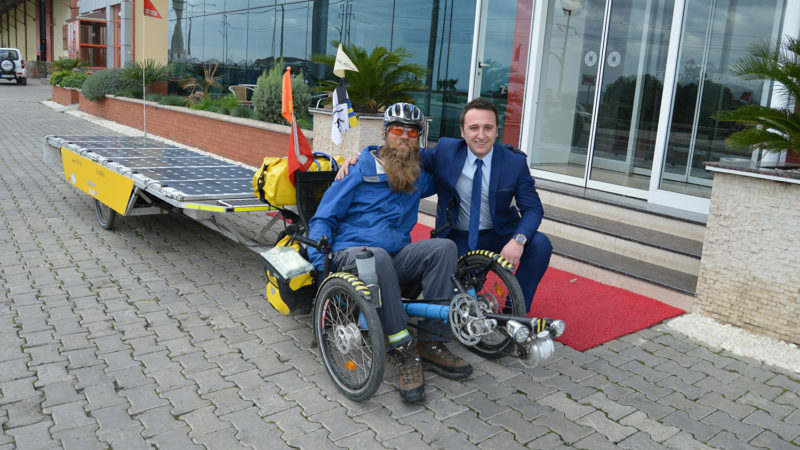 He chose a trike (recumbent tricycle) for comfort with a large trailer capable of capturing a large amount of solar energy. It also allows him to carry a lot of personal business, including his guitar and photographic equipment. In 2016, he reached Turkey after travelling to many European countries. It is now in Australia after a 31 000 km journey! 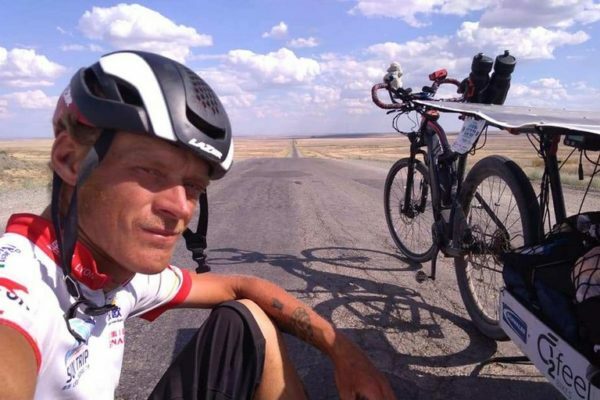 Bravo to this tireless adventurer! 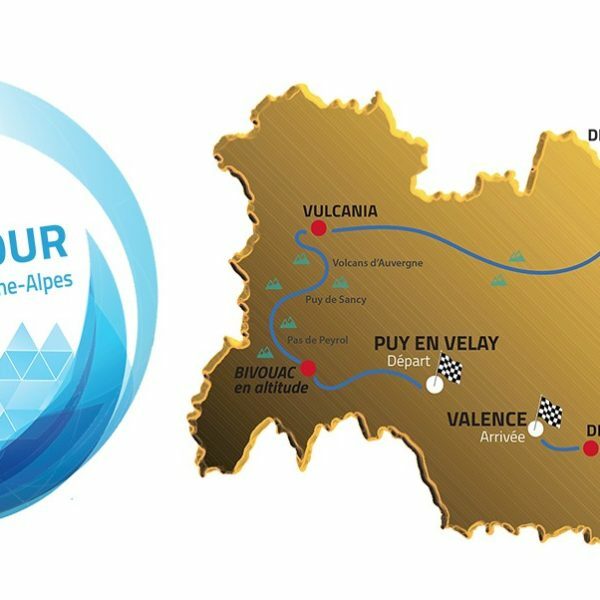 From July 6th to 20th the course of the Sun Trip Tour 2019 consists of 8 stages, always the same principle of freedom of route between each point. The course stretches on 1200 to 1500 km according to the most probable routes, with positive gradients that could exceed the 35,000 meters for the most daring! From 6 to 7 July This introductory stage proposes a smooth start of adventure through hilly areas, in often unsung landscapes. 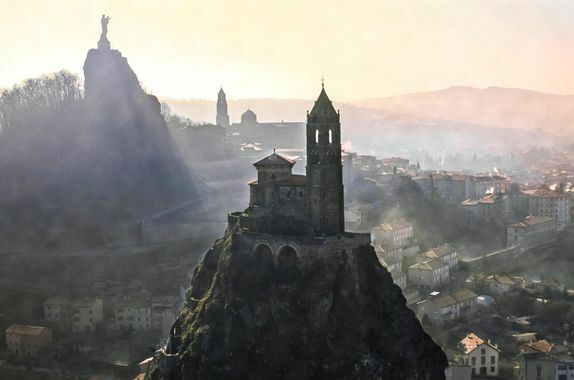 The end of the stage will however be more robust for everyone, because the bivouac in the wilderness will be positioned on the other side of the beautiful Puy Mary. The exact location will be presented later. 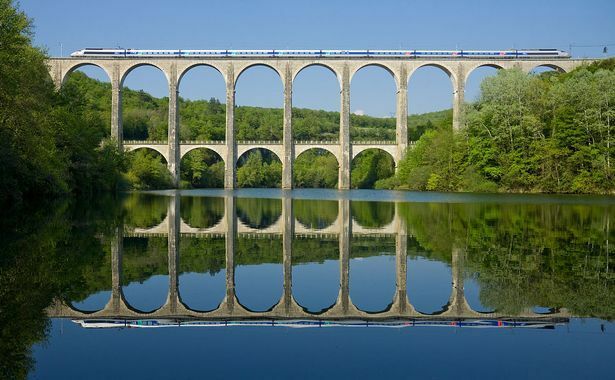 Immediate displacement ensured with this dive in what the center of France has more beautiful. July 8th to 9th. 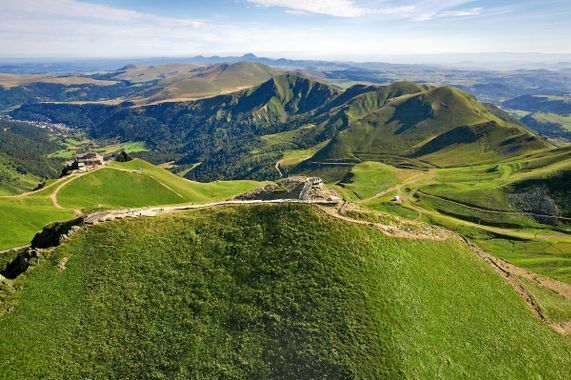 The idea of this step is simple: propose a nearly complete ascent of the massif of the Monts d'auvergne! 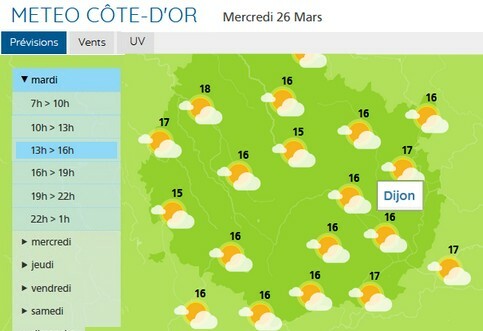 The participants playing the "challenge of the best climber" will find there a dream field to score big points, while those who want to avoid the mountains can shoot to the plain of Clermont-Ferrand. 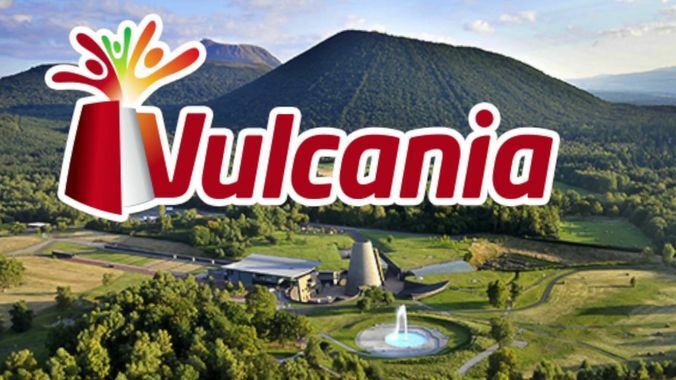 The 8 July accommodation will be held at Saint-Ours clear morning, but the real stage appointment will be well on the 9th of July in the morning on the site of Vulcania! On July 9th, from 10am until 3pm the Sun Trip Tour will be in contact with the public of Parc Vulcania. A time of exchange and promotion of new energies. 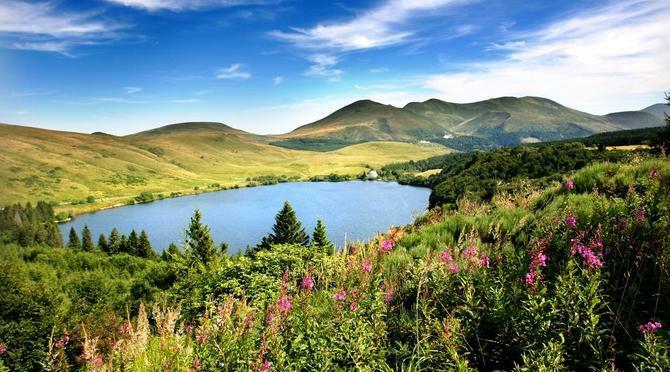 The opportunity also for the participants to know all about the volcanic activity of the mountains of Auvergne. In the middle of the afternoon the platoon was soar for the longest stage of the edition, through the departments of the Puy-de-Dôme, the Loire, the Rhône and the Ain. 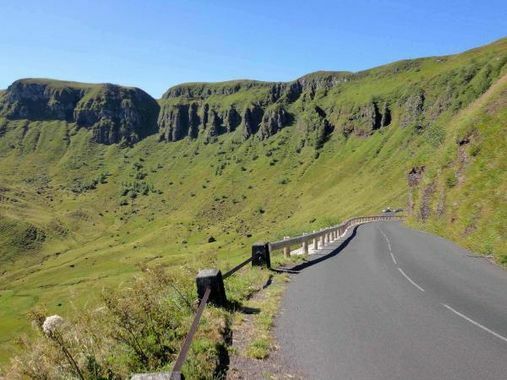 Two and a half days of road for 400 km relatively flat, with however the incentive to cross the mountains of Jura just before diving on Divonne-les-Bains (checkpoint at the viaduct of Cize-Bolozon). 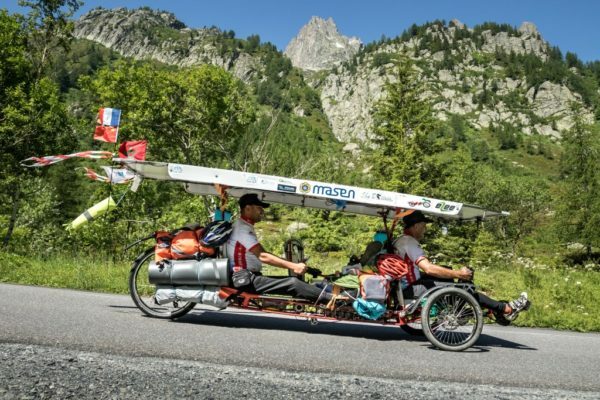 On 12 July and after a musical bivouac on the shores of Lake Divonne, the Solar bicycle platoon will make a stopover in Switzerland, in the centre of Geneva. 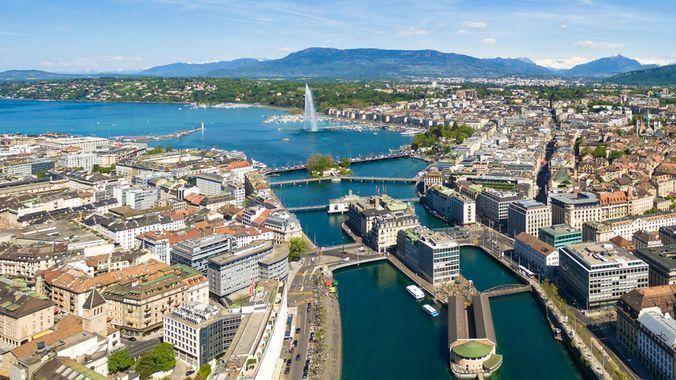 The opportunity to promote the Swiss teams involved and to talk about the Sun Trip in a country passionate about solar projects (solar Impulse, solar Planet, Solar Stratos…). 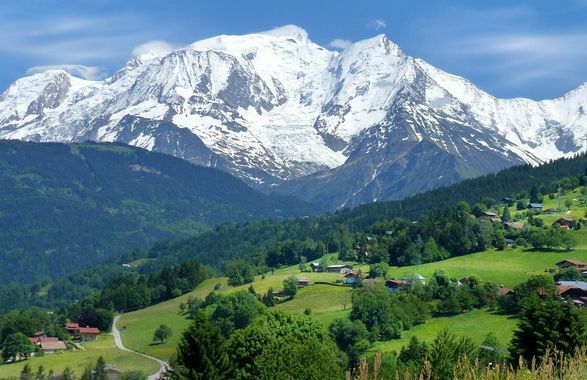 The return to France will be through the Green lane connecting the town of Annemasse, then the participants will have the opportunity to complicate or not the task by going up the White Valley to Chamonix. July 13th to 14th. Certainly the key step for the climbers, through the mountains of Savoy Mont Blanc (Ascent of Megève, col des seizures, Cormet of Roselend, etc…). The real starting point of the Sun trip 2018 to China, Chamonix will be for the adventurers of the Sun trip Tour 2019 The real starting place of the Alpine crossing. 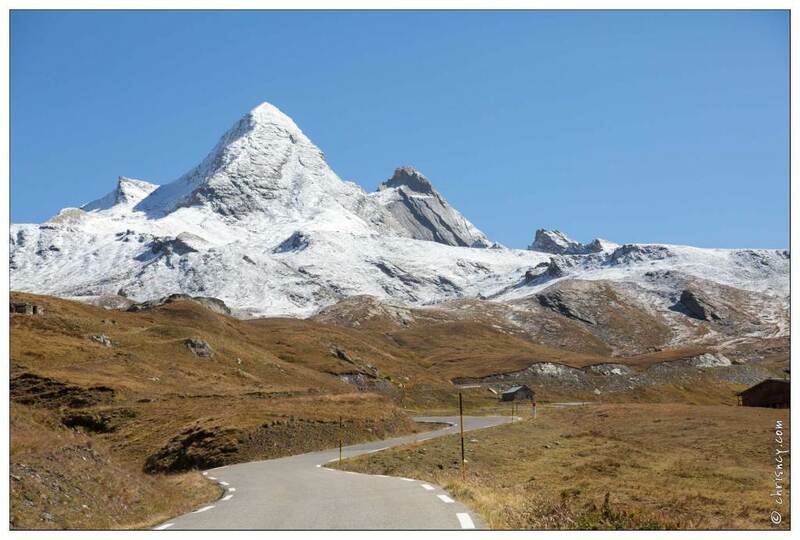 Some might also opt for a detour by Switzerland and Italy, taking the passes of the Grand and Petit-Saint Bernard, before joining the summit of the Alps on the Col de Iseran, at 2770 m altitude! It should be noted that those who want to save their strength can opt for the Albertville plain and the Maurienne Valley. 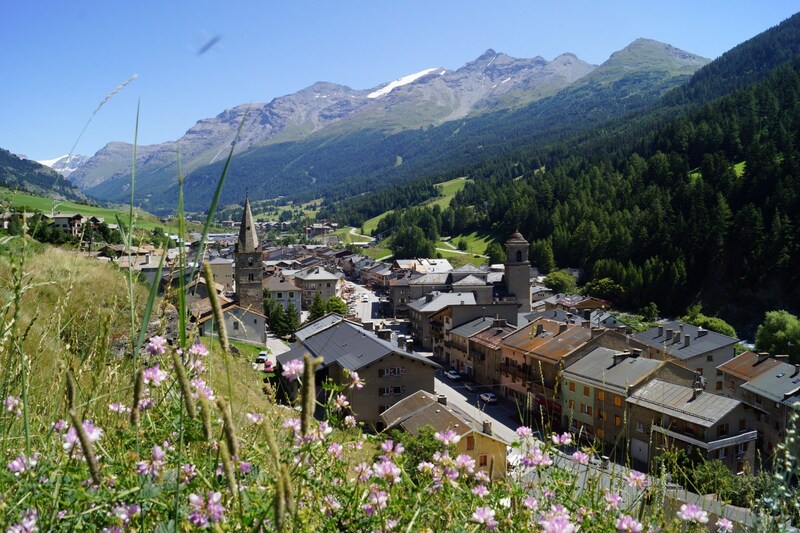 On 15 July the participants will be able to enjoy the grandiose landscapes of Haute-Maurienne, welcomed at the Gîte Ethic CIS stages of Val Cenis. This time of relaxation will be the occasion of planned animations with our partners. Also the opportunity for possible stragglers to join the group. A short but explosive stage, programmed on July 16! 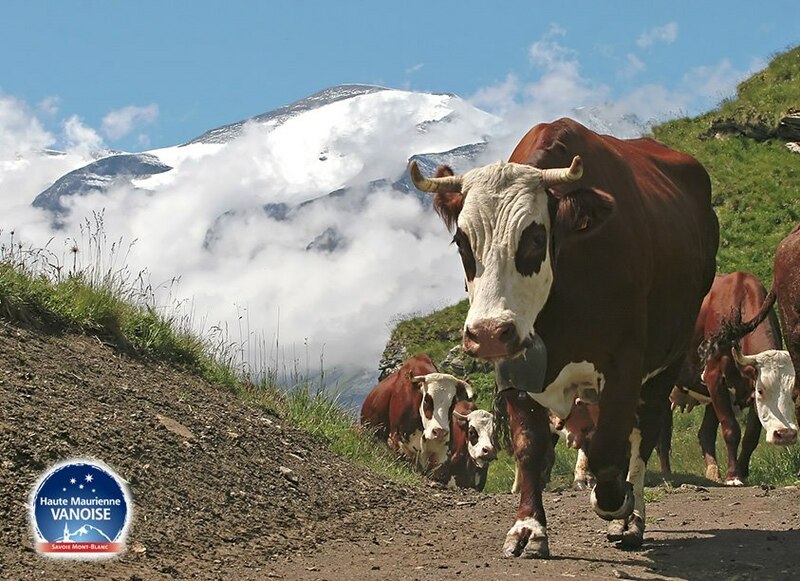 The start will be marked by a passage imposed at the Col du Mont-Cenis, at 2081 metres above sea level. 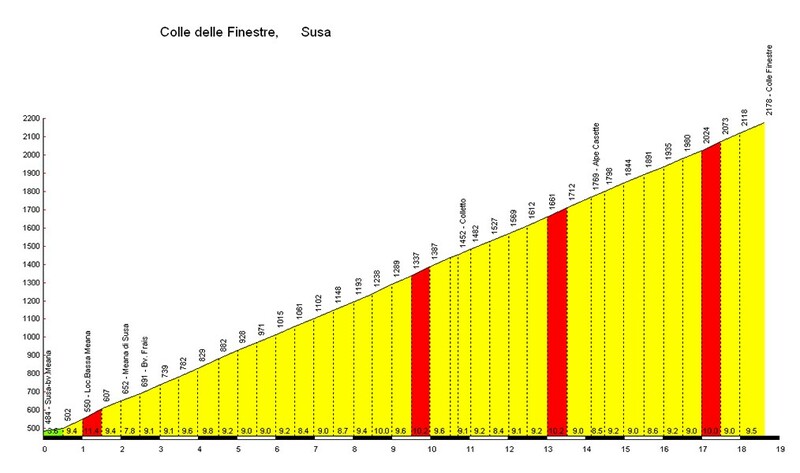 A climb that should be approached in a grouped platoon, for the first time on a Sun Trip. 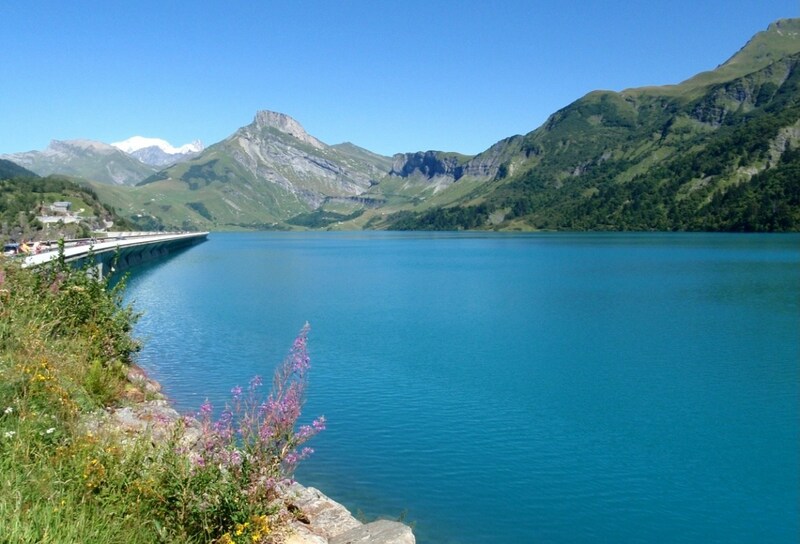 Beyond the dam of the Lac du Mont-Cenis, the participants will descend to Suze in Italy, and from this point the most courageous can try to climb the terrible Col de Finest, whose last 10 km are not paved. 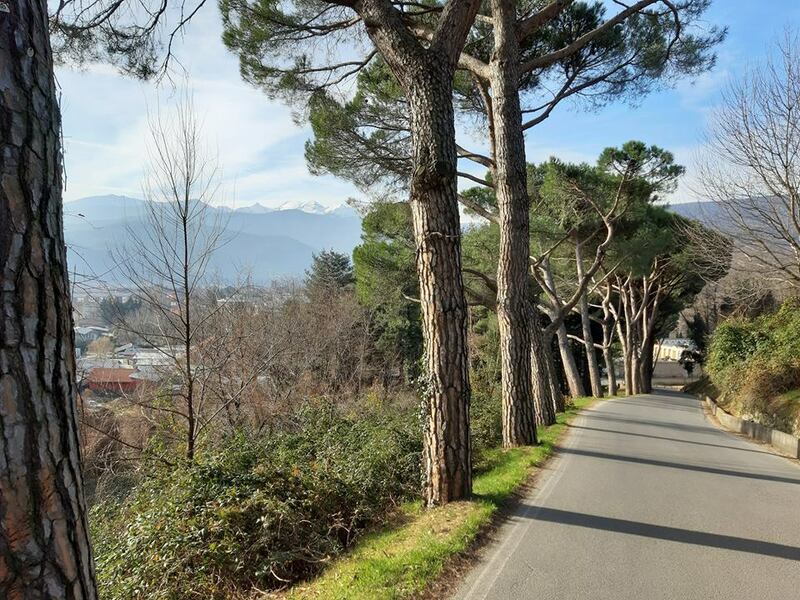 Pinerolo will be the only real step outside of France, a city that has already hosted the Tour de France and that receives the tour of Italy in May 2019. The meal will be held at the boulodrome of the Veloce Club and the night in the convent of the Sisters of the Visitation Santa Maria. 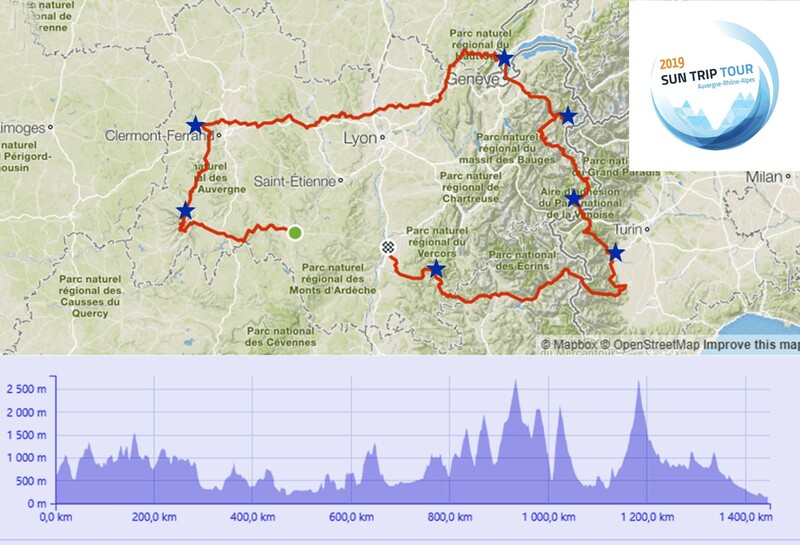 From 17 to 19 July, this stage is certainly the least predictable of adventure. The return to France can be done either by the very difficult Col Agnel (2744 m! 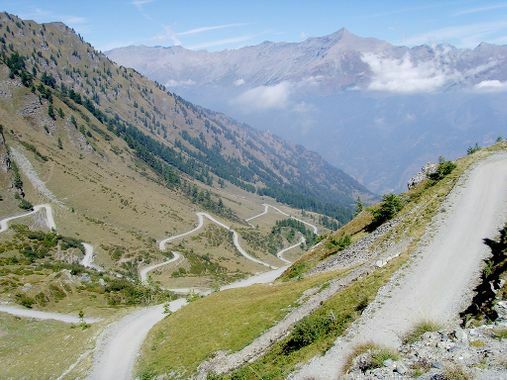 ), or by the "Sestriere – Col de Montgenèvre" web. 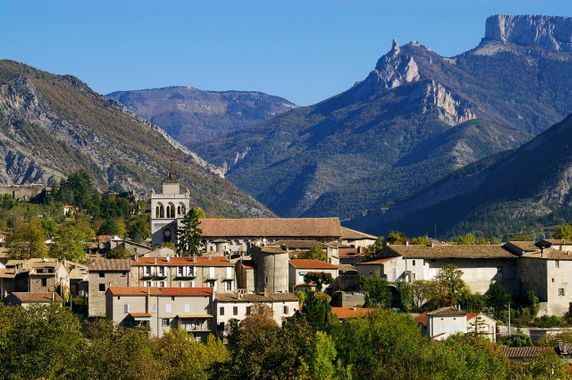 The Massif of the Ecrins will then be bypassed by the south (more likely) or by the north, while some might have the idea of firing to the National Park of the provençales. Opportunities to go scratching points and visit breathtaking scenery will not fail! One thing is certain, coming to Die the difficulties will be passed. A day of parade to close the loop, Saturday, July 20, 2019. 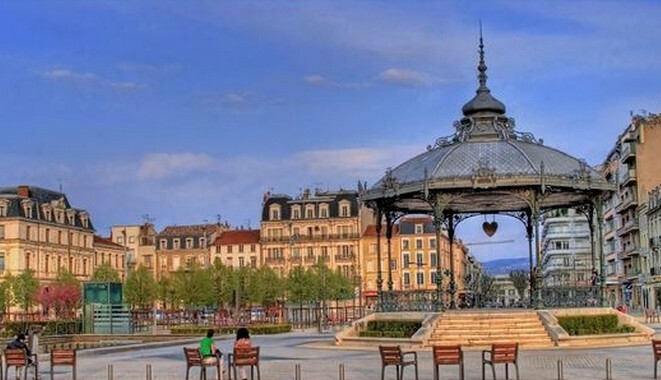 The adventurers will be happy to find the plain and will be welcomed in the city centre of Valencia, capital of the Department of Drôme, a city at the crossroads of several major cycling routes in the region Auvergne-Rhône-Alpes. 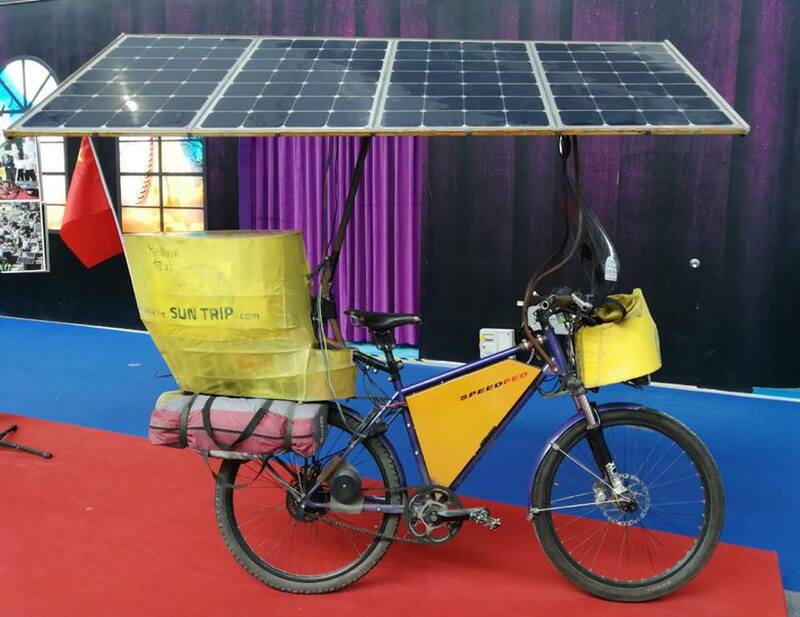 A communication shot around the concept of solar bike and the Sun Trip will turn its gaze towards China, in view of the 2020 edition! 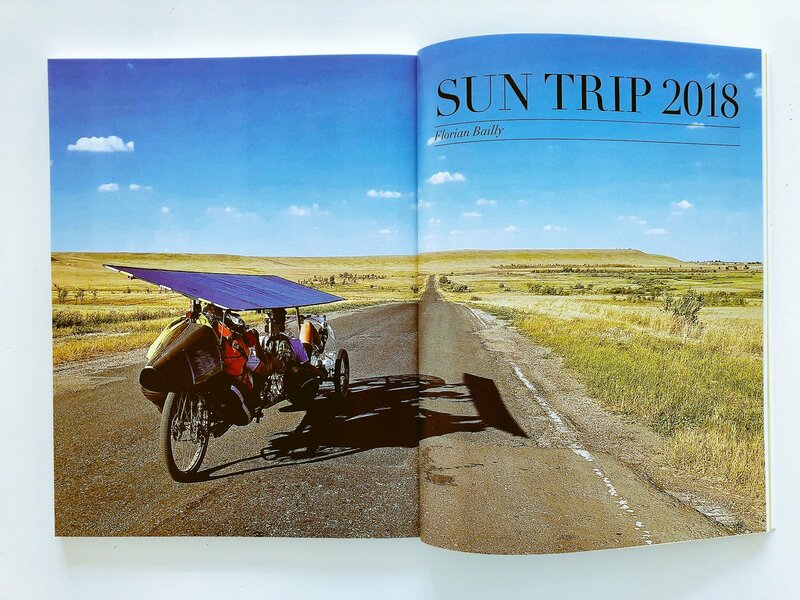 The report of GEO Adventures magazine on the Sun Trip 2018! The success of the Sun Trip 2018 Lyon-Canton was yesterday hailed by the Chinese Ambassador in Paris, its excellence Zhai Jun. 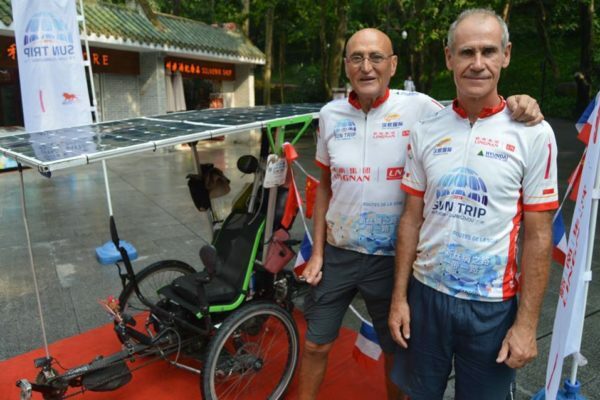 French adventurers Mickaël Joguet and Eric Morel, respectively 2nd and 3rd in the solar challenge, were rewarded on behalf of all the participants. This ceremony was organized at the opening of the 2nd forum of new silk roads, in the presence of Alain Galliano (Vice-President of Greater Lyon), Xing Qu (Deputy Director General of UNESCO), Pascal Boniface (President IRIS), Christian Cambon (Chairman of the Senate Foreign Affairs Committee) and Xinchen Deng (European representative of our Chinese partner WAE Logistics). The portraits of 8 new Suntripers are published! 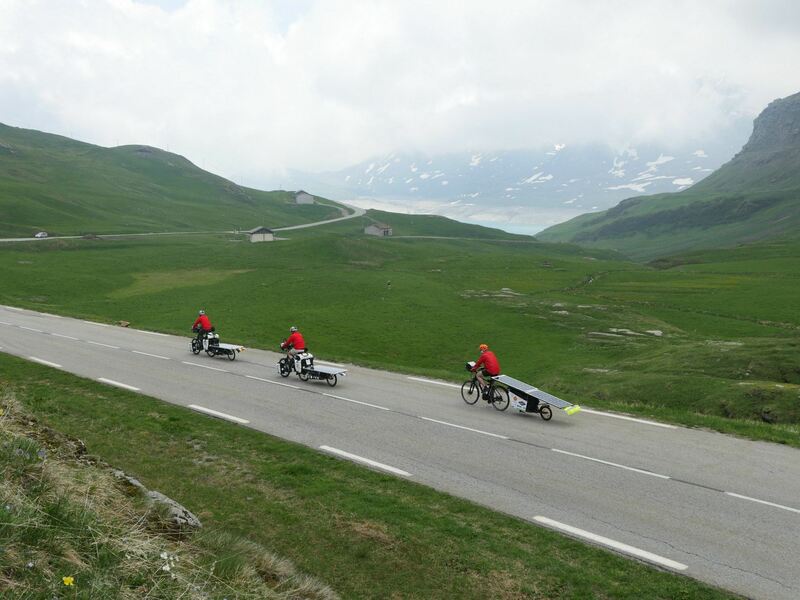 Four of them had participated in the Sun Trip 2017, we had rode together: Jean-Louis The Super Fighter, Ryan who had repaired his trailer with old recycled skis, Francis and his trike "Tribellule", Alain who had unfortunately to give up because technical problems. 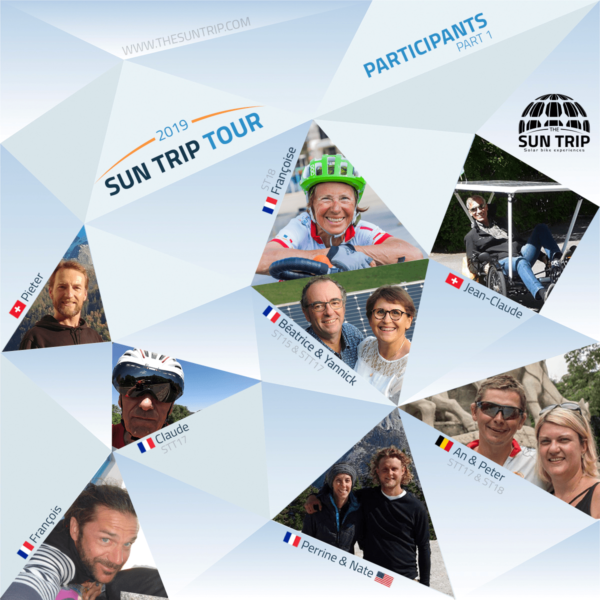 Welcome to the 4 new suntripers : Rain, Fabrice, Michel and Dario! About forty participants are known, there are still a dozen more that we will soon discover. 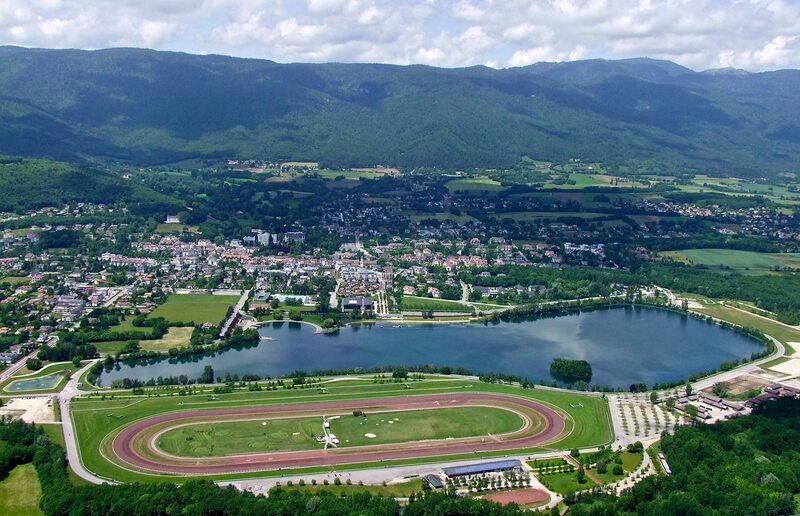 For we will be 50 to take the start, on July 6 next in Le Puy-en-Velay, a record! 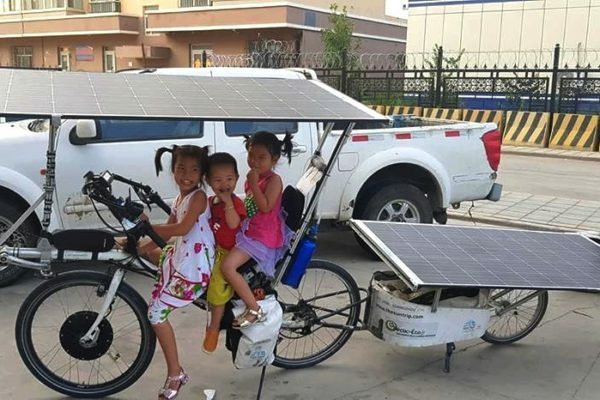 Solar panels on a bike! How? 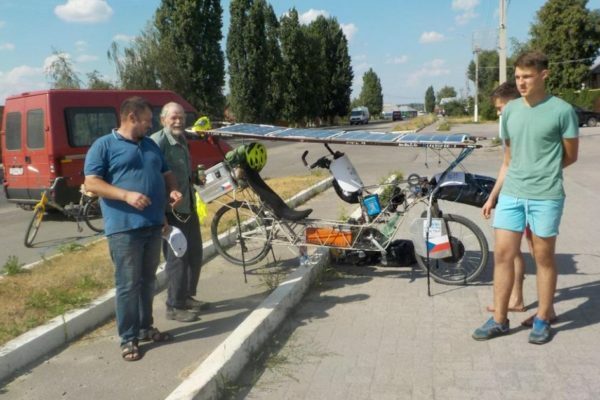 Installing a solar panel on a bike may sound simple at first. But if we want to do long distances, we are tempted to embark a large area of solar panels and the installation becomes more complex. The creativity of each suntriper has given birth to many original solutions. The table below shows the variety of combinations selected by the participants in the different editions of the Sun Trip. In the Sun Trip, the regulation allows a surface of solar panels of not more than 2, 5m ², for a maximum power of 450Wc (visible panels). 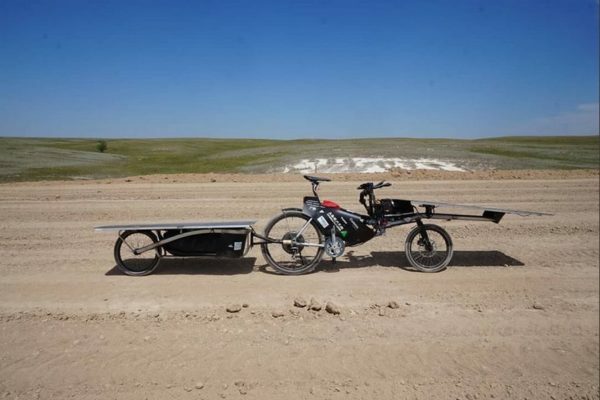 The installation of such a panel surface is not simple and can also steer the choice of the type of bike: tandem, cargo bike, reclining bike, recumbent tricycle (trike), or encourage to add a trailer. 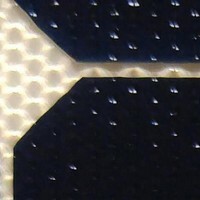 The constraints encountered sometimes require the designer to install a lower surface of panels, at the expense of the vehicle’s autonomy. On the reclining/seated tandem of Raf van Hulle, the seating position at the front is sacrificed to accommodate a panel, supplemented by other panel on trailer (Sun Trip 2013, 2015, 2018). 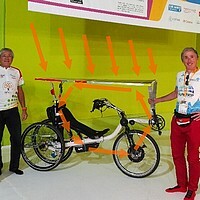 This front layout is found on cargo bikes, except for the cargo bike experienced in 2013 by Lionel Candille with roofing panels. 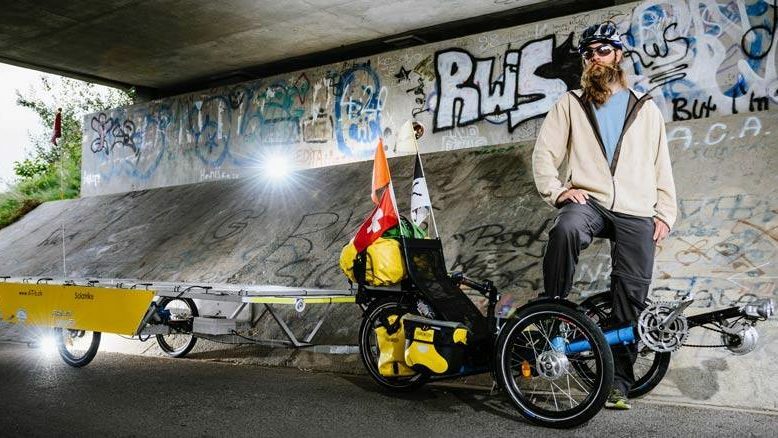 In 2018, Éric Morel had a sign attached to the back of his cargo bike. 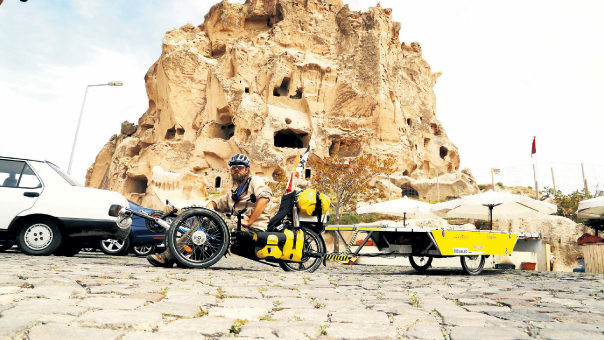 On recumbent bikes and trikes, the panels are frequently installed in “roofing” and are sometimes supplemented by a trailer panel. 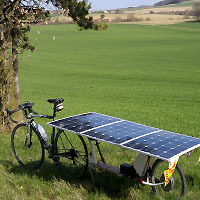 On conventional bikes, the panels are very frequently installed on a trailer. 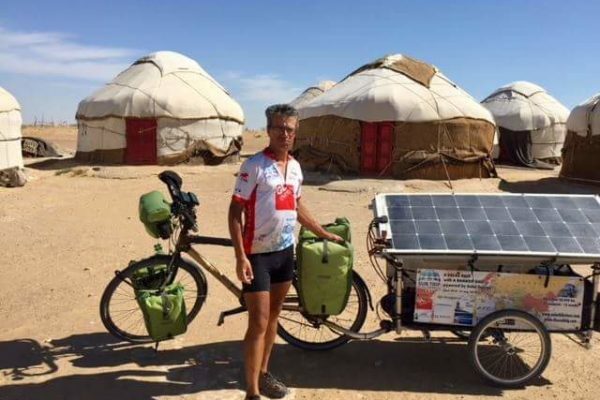 One exception, Daniel Jenni installed his “roofing” Panel on a classic bike for the Sun Trip 2018.
Who will participate in the Sun Trip Tour 2019? Are all the next Suntripers present in this photo-montage? No, if thirty are already posted, there are still about fifteen or twenty that we will discover soon. 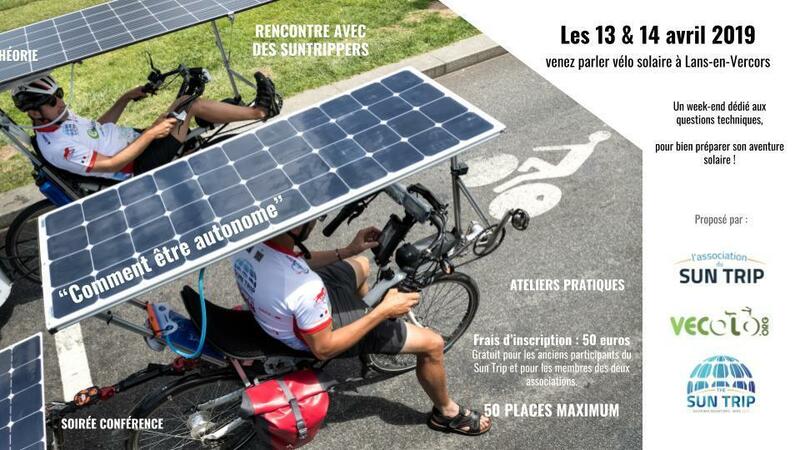 They will probably be about fifty to take the start, on July 6 next in Le Puy-en-Velay, a record! 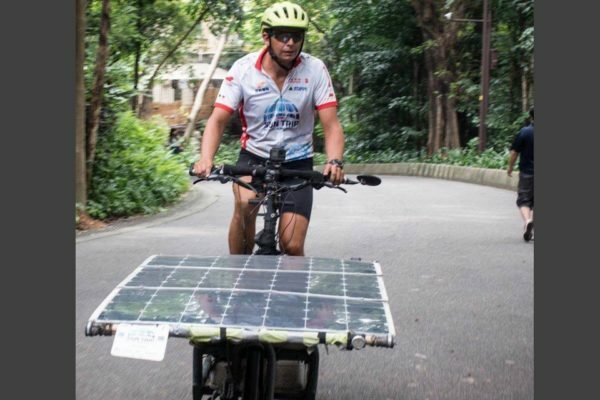 Sushil Reddy is a young Indian engineer who has carried out over 7500 km of solar cycling in India and in various contines. We participated together at the Sun Trip Tour 2017. 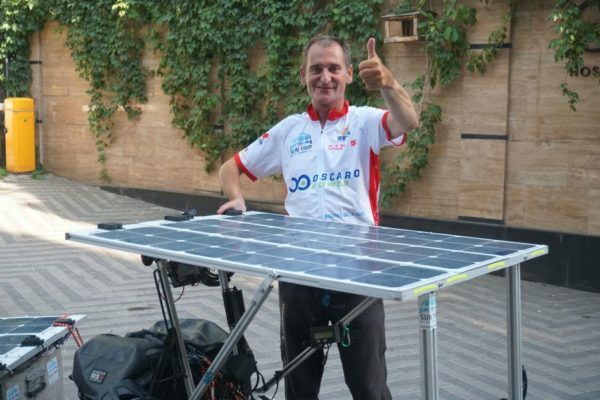 He is now one of the “80 Day Race Ambassadors” alongside Bertrand Piccard (Solar Impulse) and many other adventurers. Sun Trip 2018 trailer ! 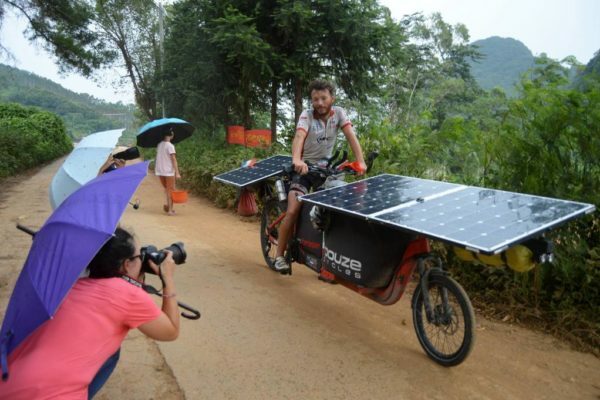 An adventure that has transformed them all, and that shows us the efficiency of this new form of mobility on solar bike!